A key member of the manufacturer’s ProXpress family, the Samsung SL-M4583FX mono laser multifunction printer is more than an average monochrome printer. It reduces ownership costs with high capacity Samsung SL-M4583FX toners and economy power consumption of 900-watts maximum. In addition to printing stationery from A6 right through to envelopes, the Samsung ProXpress SL-M4583FX printer offers paper handling capabilities that owners are able to tweak to their particular requirements. Offering a stylish, no-nonsense grey and black finish, the Samsung ProXpress SL-M4583FX mono laser printer is a testament to the skills of its designers. The standard model weighs in at 32kgs and has external dimensions of 530 x 543 x 647 millimetres. The SL-M4583FX features on-board interfaces for USB and Ethernet connectivity. The touchscreen is a decent sized 10.1 inches and incorporates all the functions of an android smartphone or tablet. The SLM4583FX multifunction printer is a genuine AIO as it offers the means of scanning, copying, faxing and even has a slot for an external telephone. Prior to adding extra trays, the M4583FX multifunction printer has a 650-sheet input capacity of 650 75gsm pages which includes a 100-sheet multipurpose feeder. The output tray holds 500 pages. The Samsung M4583FX mono multifunction printer boasts duplex twin-sided printing capability and has a 50-sheet auto-feed for convenient multi-page scans, copies and faxes. Utilising three optional 550-sheet paper-input trays ups total capacity to 2,300 pages. In A4 format, the ProXpress M4583FX laser printer delivers 45ppm with a first print time in ready mode of 6.5 seconds. A 1GHz processor ensures no delays and smooth operations whatever the function. A 200,000 image monthly duty cycle leaves this machine ready to cope with the demands of hectic work environments. Ideal for handling heavy workloads, this printer can be equipped with a 40,000 page extra high capacity Samsung M4583FX black cartridge which boosts productivity. 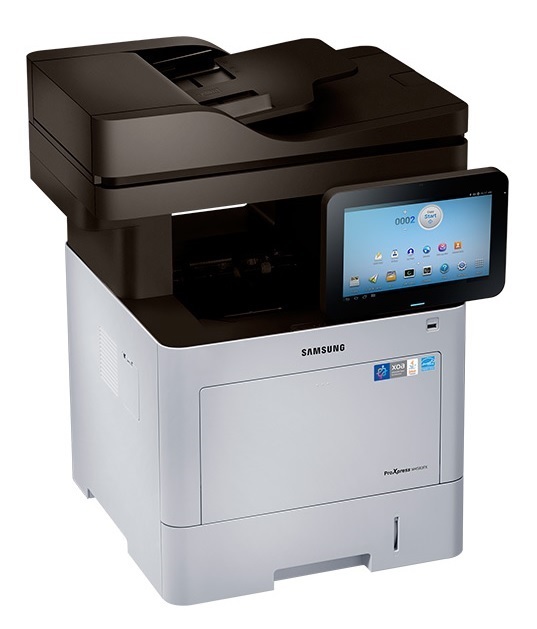 For the Samsung SL M4583FX mono laser MFP to truly be a network enabled device, it should offer inbuilt wireless and NFC connectivity.